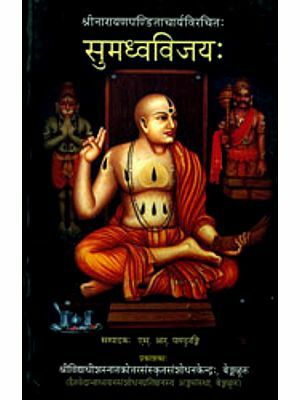 Sumadhva Vijaya is a biographical poem in which the life and the message of Sri Madhvacharya, the Founder of the Dvaita School of Vedanta, are described. Sri Madhvacharya travelled all over India twice covering the entire land from Ramesvaram to Badrinath. In the course of his journey he visited important centres of learning. Distinguished Scholars met him and debated with him. Contemporary rulers also met him and paid their respects. These events are described in this poem. It has therefore historical importance also. The philosophical debates which Sri Madhvacharya had with the scholars are summarised. In the course of this summary important philosophical concepts are explained. This has made it a philosophical poem. 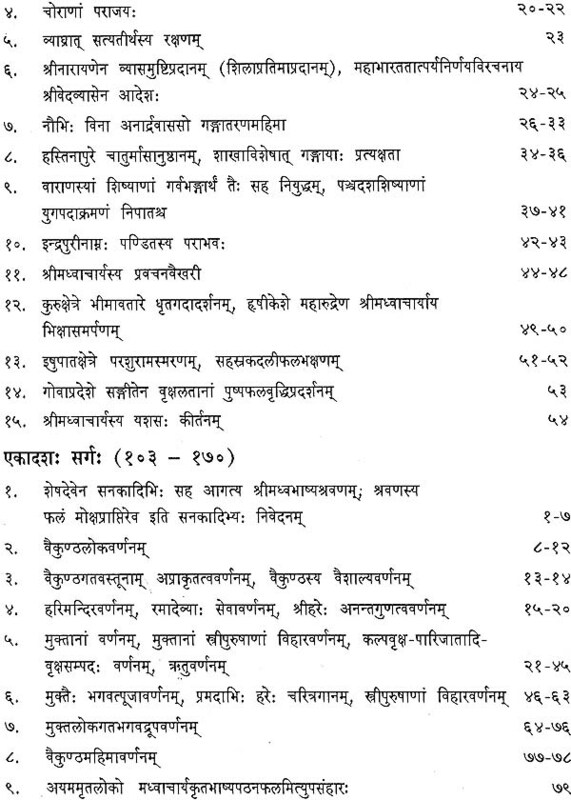 The thirty-seven works of Sri Madhvacharya are mentioned and briefly introduced. 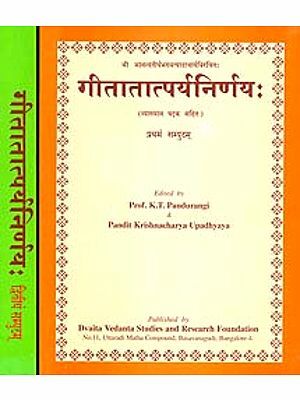 In addition to the text of Sumadhva-Vijaya, the commentary of the poet himself and two later commentaries by Sri Visvapati thirtha and Sri Chalari Seshacharya are included in this edition. Sampradaya Paddhati of Sri Hrishikesha Thirtha and Sumadhva-Vijaya phala malika of Sri Visnu tirtha are added at the end. A detailed summary of the contents of the entire poems is given in English and in Kannada for the benefit of those who are not quite familiar with Sanskrit. The first edition of this work was published by Dvaita Vedanta Studies and Research Foundation, Bangalore in the year 2000. Sri A.B. Shyamachar and Sri S.R. Pandurangi, have edited this work. They have used their best efforts in preparing the Second Edition of this book. We record our appreciation of their co-operation. We also thank M/s. Dhaarini Graphics for quality printing. 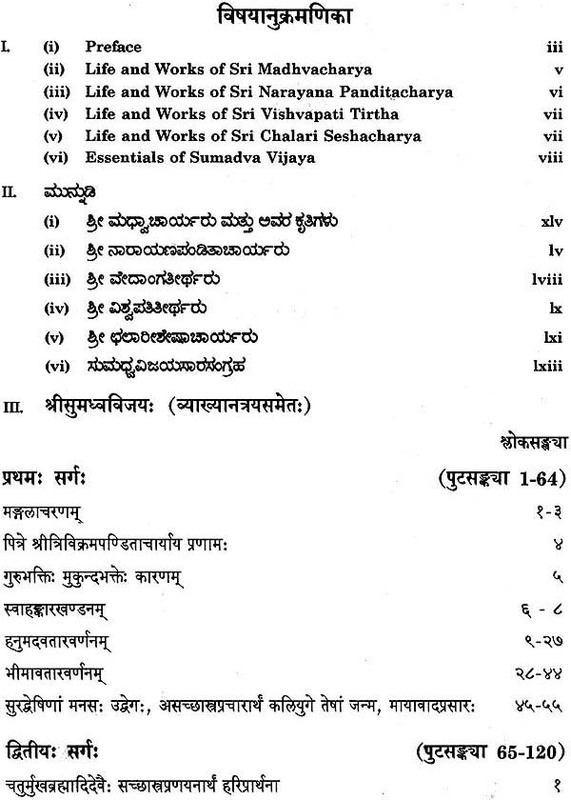 Sri Sumadhva Vijaya Mahakavya is a unique biographical poem. 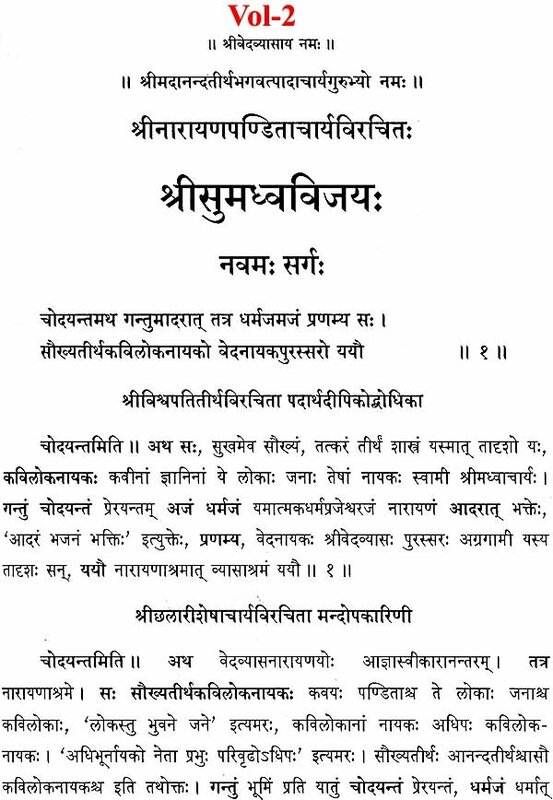 The life and the message of Sri Madhvacharya, the founder of Dvaita Vedanta and Vaisnava religion are described in this Mahakavya. It has three dimensions : (i) It is a historical poem (ii) It is a philosophical poem (iii) It is a poem of excellent literary quality. While describing the life and message of Sri Madhvacharya the historical background of the times is given. Particularly the confused state of the mind of people and the need for the removal of such confusion is explained. Reference to- the names of contemporary scholars and some contemporary rulers is made. Important centres of learning and culture are mentioned. It gives a fairly good account of the cultural and intellectual environment of the country at that time. As it is a biography of a philosopher, his philosophy is fully explained. There is an impressive description of the philosophical debates, exposition of the philosophical concepts, and a detailed reference to the works of Sri Madhvacharya. 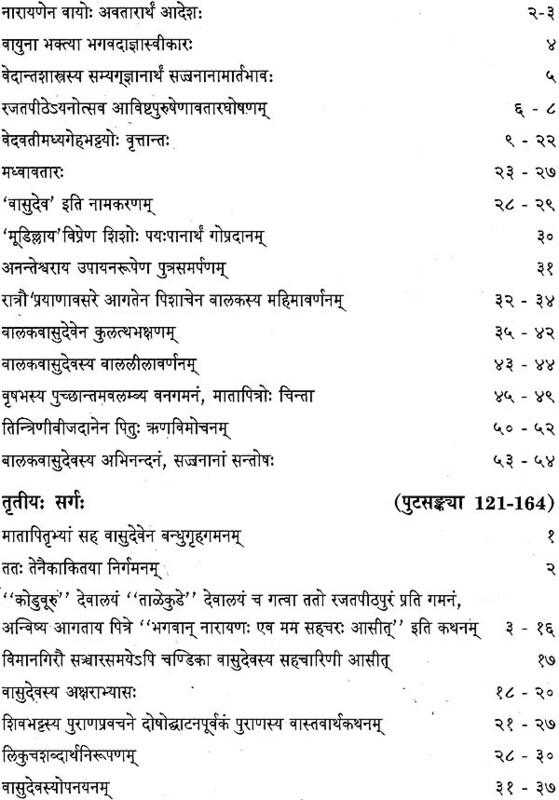 Since a literary medium is chosen to describe a philosopher and his philosophy, the poet has used it very effectively introducing all aspects of literary excellences such as a variety of figures of speech viz upama rupaka, utpreksa, a variety of metres like upajati, vasanta tilaka, emotions and sentiments, a rich vocabulary, alliteration and pun. A reader gets absorbed both in its charming style and the depth of philosophical thought. The crowning feature of the whole presentation is the deep devotion of the poet to Sri Madhvacharya whose biography is more than mere a theme of poetry for him. It is a hymn that is intended to be recited by his devotees. In fact it is recited by pious Madhvas on every Saturday and certain special days. Its mystic power is experienced by many. This Mahakavya commences by offering obeisance to lord Narayana, Sri krsna and Sri Vedavyasa. The name Krsna refers to both Yadava Krsna and Krsna dvaipayana. Therefore by a pun on the word Krsna and its adjectives both are praised. Then, the poet seeks enlightenment from Sri Madhvacharya and offers salutations to his father and preceptor Sri Trivikrama Pandita. 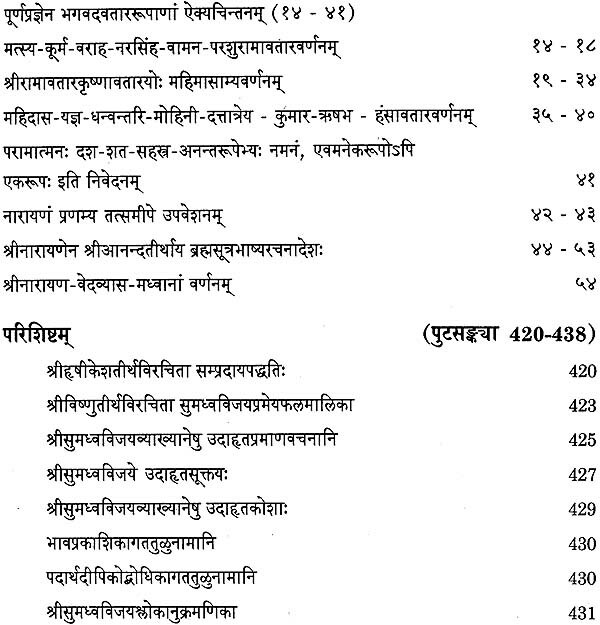 He refers to his commentary Tatvapradipa on Sri Madhvacharva's Brahmasutra bhasya. He states that he is composing this Mahakavya to serve two purposes viz. i) To obtain Haribhakti through Gurubhakti (ii) To provide delight to the noble persons. He seeks the sympathy and support of noble persons for his task, since, it is a heavy responsibility. He proposes to describe the glory of the three incarnations of Mukhyaprana which is described in vedic hymns like Balittha Siikta and Pavarnana Sukta. It is difficult to arrange the great deeds of Sri Madhvacharya in an order. Therefore the poet begs the pardon of the readers, if he has stated an earlier event later and a later event earlier. This indicates poet's humility. However, the theme of his poem is very well planned and neatly accomplished. In the first canto the main events of the two earlier incarnations viz. Hanuman and Bhimasena are graphically summarised. The second canto describes the background and the need of the third incarnation, the birth of Sri Madhva and his childhood. The third canto describes his boyhood, upanayana and gurukulavasa. This is a preliminary stage of the theme. 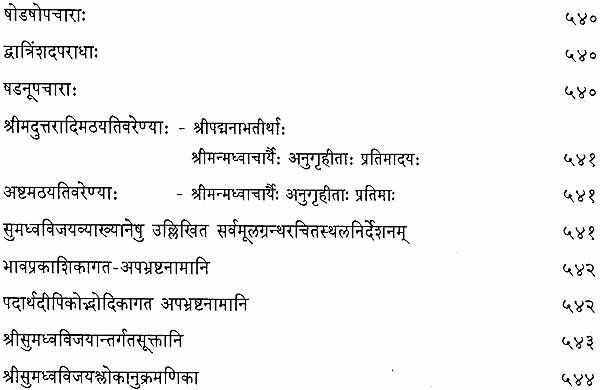 In the 4th and 5th cantos Sri Madhva takes sannyasa asrama from Sri Achyutapreksa, he is coronated on the Vedanta Samrajya peetha and named as Ananda tirtha. He writes a bhasya on Gita, undertakes South Indian tour, visits Trivendrum, Kanyakumari, Ramesvararn, Srirangam and Srimusnam and returns to Udupi. 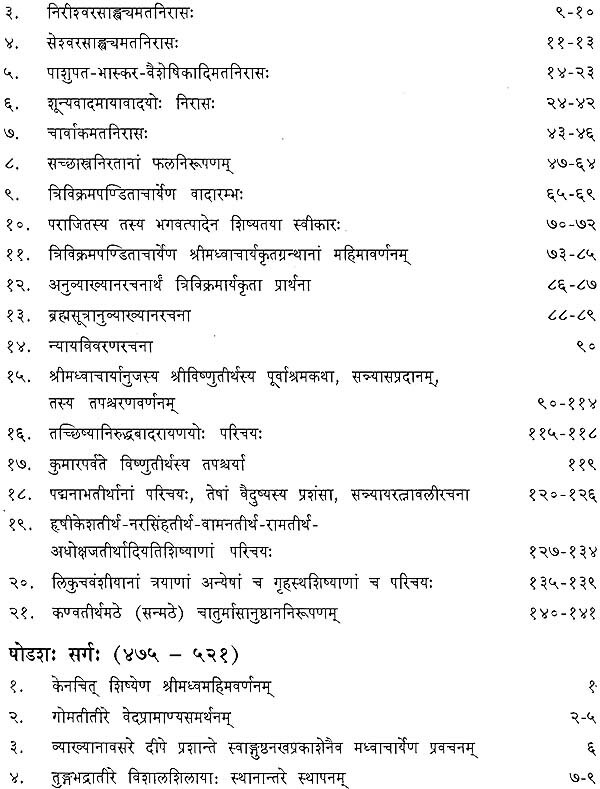 This is the first stage in Sri Madhvacharya's ascetic and academic activities. 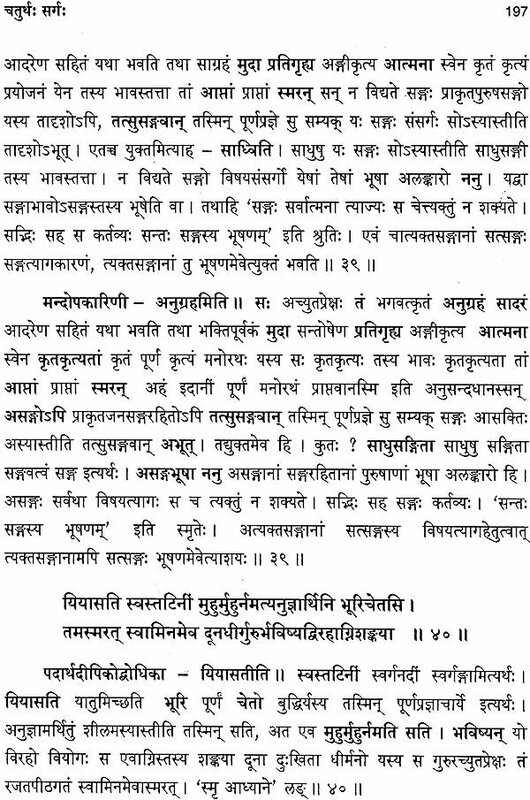 In 6th to 8th cantos his visit to Badari, offering of his Gitabhasya to lord Narayal)a, visit to Vedavyasa asrama and lord Narayana's advice to Sri Madhva to write a Bhasya on Brahmasutra are described. In the 9th canto Madhva returns to Vyasasrama, listens to the discourses of Sri vedavyasa and learns everything that is valuable and returns to Anantamatha. He composes Brahrnasutrabhasya. He moves out from Anantamatha, Shobhana bhatta and many other scholars meet him on his way back to Udupi. He returns to Udupi and establishes Sri Krsna temple. This is the second stage in the development of the theme. In the 10th canto certain events that revealed the extra-ordinary strength and power of Sri Madhva are narrated. In 11th canto there is a beautiful description of Vaikuntha. 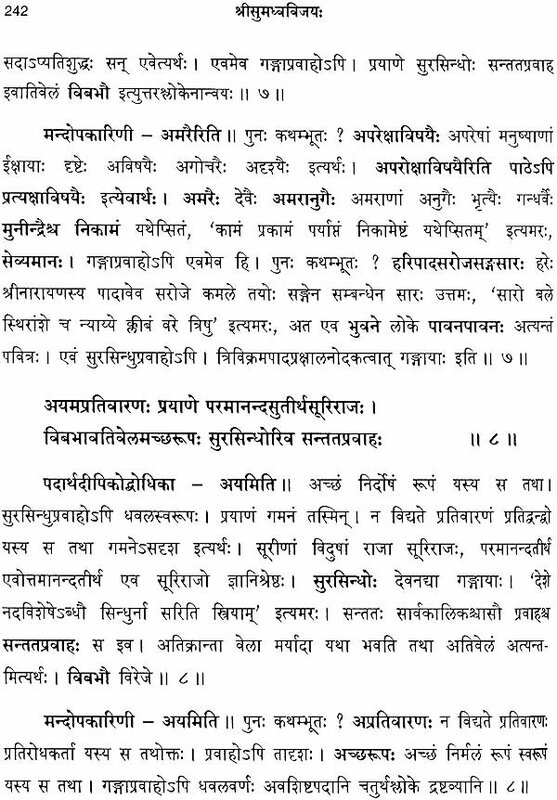 In 12th canto Pundarikapuri and Vadisimha trymg to uphold advaita and their defeat, Sri Madhva's mastery on Vedic hymns, the theft of his Library are described. In 13th canto king Jayasimha invites Sri Madhva to his city Sri Madhva proceeds in a grand procession. He goes to visnumangala temple. Here the poets narrates the birth and education of Trivikrama Pandita who will meet Sri Madhva in the 15th canto. 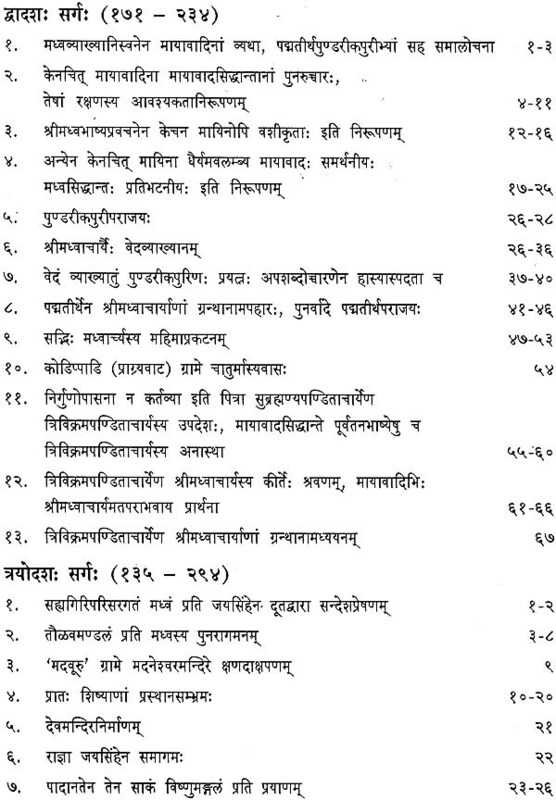 In 14th canto the- daily rituals and the teaching programme of Sri Madhva are described. 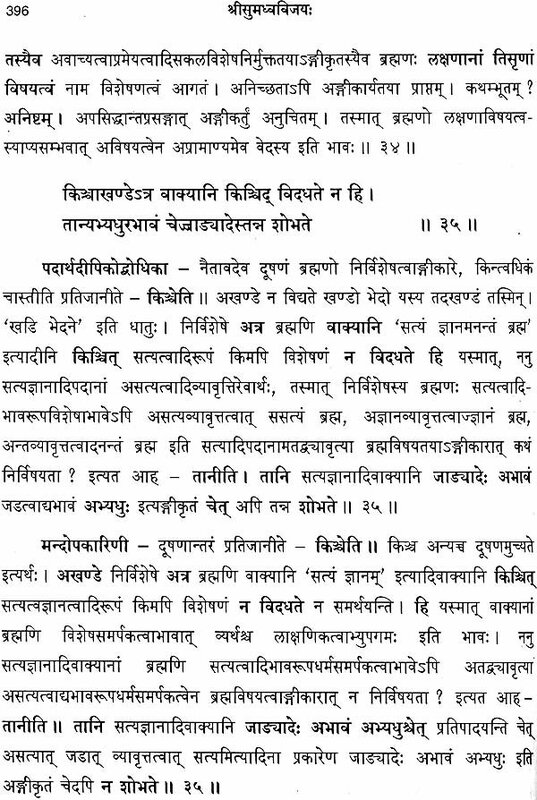 In 15th canto Sri Madhva's ,discourse on different systems of philosophy and his pointing out the drawbacks in the same and his exposition of Tatvavada are described Trivikramapandita who was listening this discourse debated with him for fifteen days and becomes his disciple. 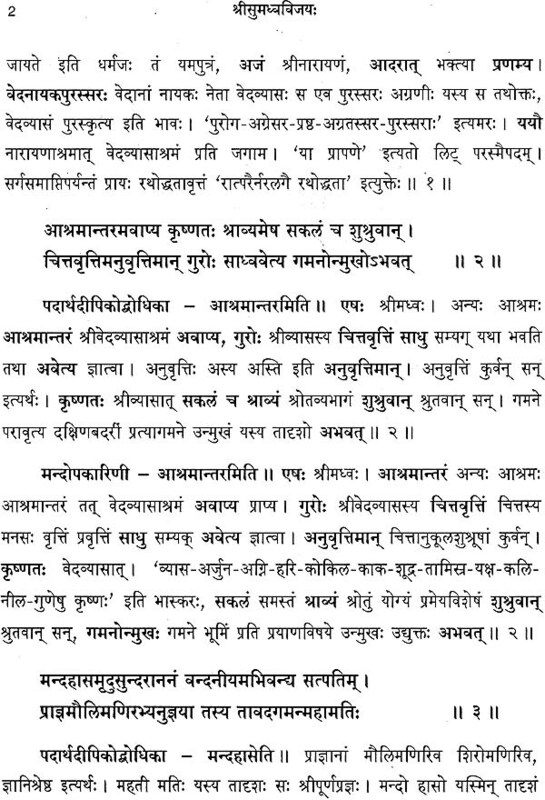 He praises the works of Sri Madhvacharya, Before concluding this canto Sri Visnutirtha the younger brother of Sri Madhvacharya, Sri Padmanabha tirtha who was mentioned as Sobhana bhatta earlier and many other Sannyasin desciples of Sri Madhva are mentioned. This is the third stage of the theme. In - 16th canto certain important events not mentioned earlier are recapuchulated. Finally the poem is closed by a glorious event of Deities and Gandharvas showering flowers from the sky on Sri Madhva when he was delivering discourse on Aitareya Upanisat at Anantesvara temple. The first canto narrates the main events in the earlier two incarnations viz. Hanuman and Bhimasena Mukhyaprana was born as a son of Kesari in Tretayuqa. He was named as Hanuman. 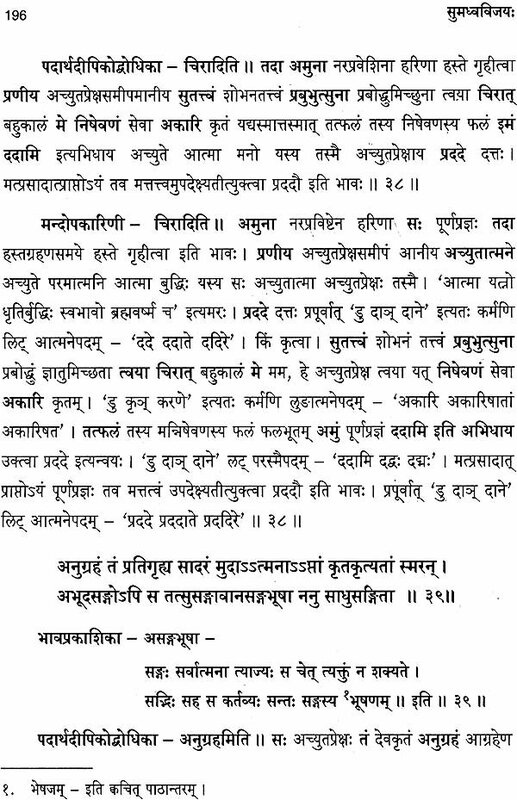 The expression hanu not only refers to knowledge but also bhakti, vairagya etc. other virtues also. As he had all these virtues he got that name. The poet describes him as Mahabhagavata i.e. he who has practiced Bhagavata dharma devotedly. He was a well wisher of Sugriva. When he saw Sri Rama he prostrated at his feet with deep devotion. Sri Rama embraced him. Sri Rama whispered a message into his ear. He went to Lanka delivered the message of Sri Rama to Sita Burnt the demons in Lanka and returning back prostrated at the feet of Sri Rama. He took Sri Rama on his shoulder, built a bridge to cross the sea. The poet describes the battle with Ravana as a sacrifice and states that Sri Rama is the sacrificial fire, Sugriva is Yajamana i.e. sacrifice, Laksmana is pratiprasthata, Anga etc are Rtviks and Hanuman himself is adhvaryu Ravana was offered in the fire at this sacrifice. In the course this battle Hanuman brought Sanjivini hill. After the battle Hanuman and served them. After coronation of Sri Rama, Sita presented a navaratnamalika to Hanuman. This was in a way an embodiment of he grace on him. Sri Rama placed his palm on his head and said I will always be present at your heart. There was plenty of wealth with Sri Rama. Hanuman was most liked person but still he asked for only the service at Sri Rama's feet. Hanuman went to Kimpurusa area and is engaged in the recitation of Rama-nama. After describing the chief events connected with Hanuman and his deep devotion to Sri Rama, the poet describes the deeds of Bhima the second incarnation of Mukhyaprana. The strength of Bhima was displayed soon after his , birth. When he was born, a tiger sitting nearby roared. Kunti was frightened and child was dropped. The child fell on the peaks of satasrnga mountain. It was pounded. The poet says Indra was able to cut only the wings of the mountain with his Vajrayudha while Bhima even as a child completely pounded a huge mountain. From Mahabharata story it is well-known that Kauravas tried to poison him, push him into deep water, burn him in laksagrha. These events are stated and it is added that after he escaped from laksagrha with his mother and brothers he met Sri Vedavyasa on his way in the forest and offered all his deeds at his feet. This is more important than displaying strength. The poet compares Bhima coming out of laksagrha to that of yogin leaving his body. The poet also takes care to say that he was born by the mere touch of vayu, It was not an ordinary birth. 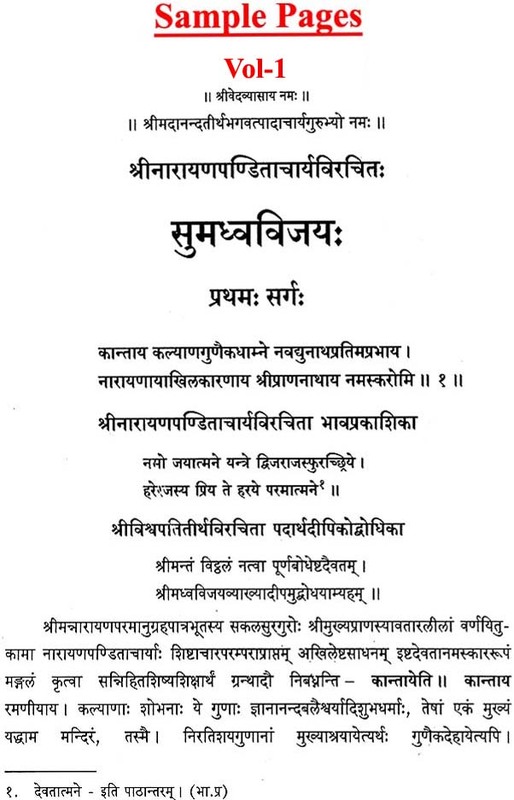 Sumadhva Vijaya is a biographical poem in which the life and the message of Sri Madhvacharya, the Founder of the Dvaita School of Vedanta, are described. Sri Madhvacharya travelled all over India twice covering the entire land from Ramesvaram to 8adrinath. In the course of his journey he visited important centres of learning. Distinguished Scholars met him and debated with him. Contemporary rulers also met him and paid their respects. These events are described in this poem. It has therefore historical importance also. 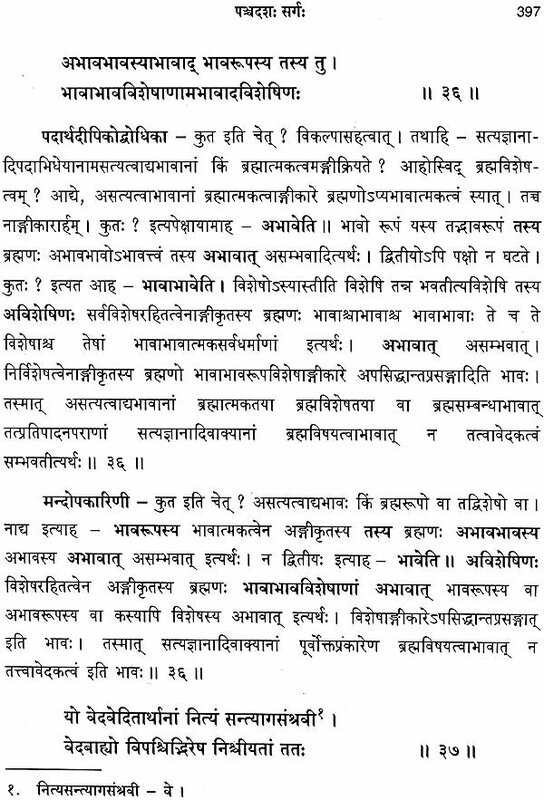 The philosophical debates which Sri Madhvacharya had with the scholars are summarised. In the course of this summary important philosophical concepts are explained. This has made it a philosophical poem. 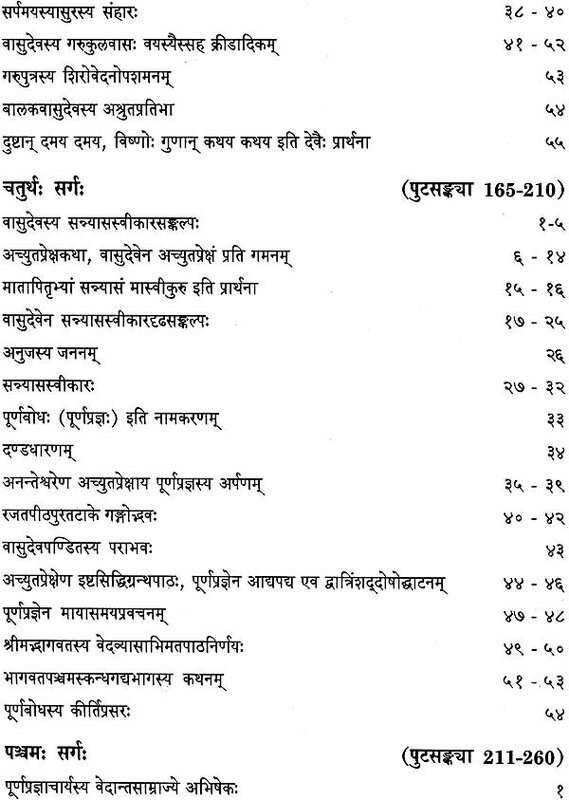 The thirty- seven works of Sri Madhvacharya are mentioned and briefly introduced. 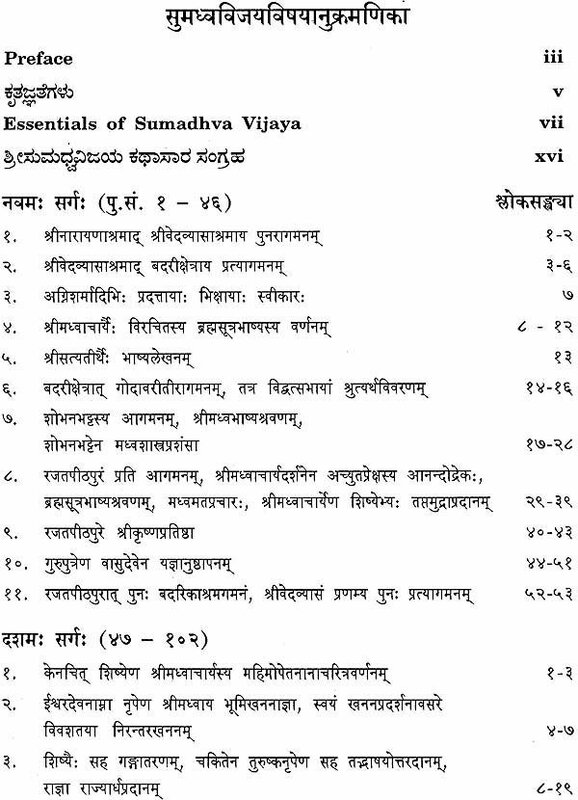 The publication of Sri Sumadhva Vijaya was planned in two volumes. The first volume containing eight cantoes is already released. This second volume contains 9th to 16th can toes. 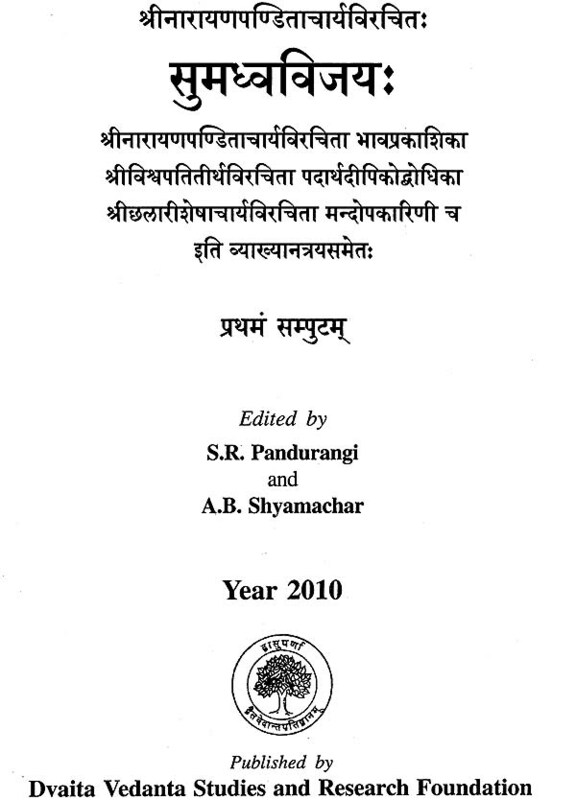 In addition to the text of Sumadhva-Vijaya, the commentary of the poet himself and two later commentaries by Sri Visvapati thirtha and Sri Chalari Seshacharya are included in this edition Prameya Navamalika, Madhvastakam, Anu-Madhvacharitam, Pranastakam, Madhvamunipratapastakam, Granthamalika Stotram and Slokanukramanika etc., are added at the end. In the first eight cantoes the life and works of Sri Madhvacharya upto his visit to Narayana asrama in the Himalayas were described. In cantoes 9th to 16th included here, his philosophical debates with two advaita scholars, king Jayasimha meeting him, his discourses at Visnumangala temple, his debate with Trivikrama Panditacharya are described. There is a beautiful description of his 37 works by Trivikrama Pandita. The special theme of each work is highlighted. A detailed account of his daily programme of worship, teaching and meeting the public are described. His most distinguished desciple Padmanabhatirtha and his younger brother Visnutirtha are introduced. Finally his departure to Badarikasrama with the showers of flowers over him by the sages and deities is graphically presented. Sri Sumadhvavijaya has historical, religious and philosophical appeal. It is hoped that the publication of this work with three valuable commentaries will help the historians as well as religious minded persons. The first edition of this work was published by Dvaita Vedanta Studies and Research Foundation, Bangalore in the year 2001. Sri A.B. Shyamachar and Sri S.R. Pandurangi, have edited this work. They have used their best efforts in preparing the Revised Second Edition of this book. We record our appreciation of their co-operation. We also thank M/s. Dhaarini Graphics for quality printing. 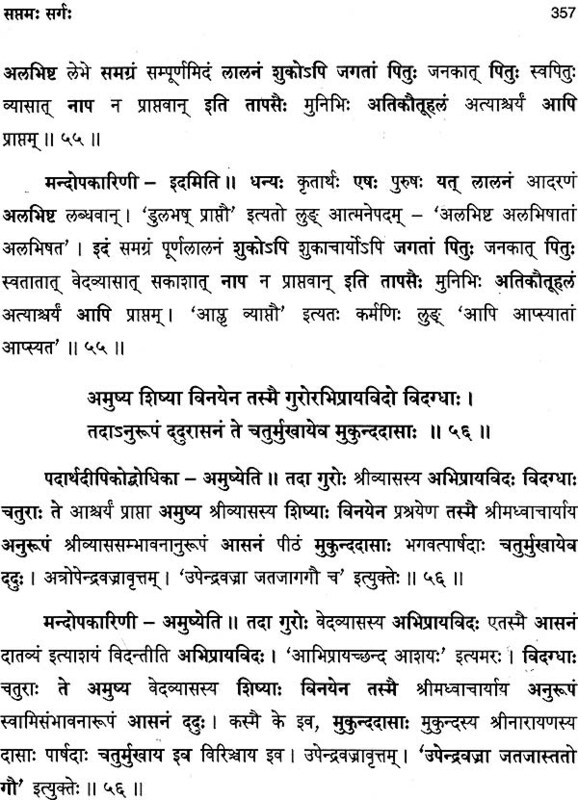 (9th to 16th Cantos) In the introduction to the first volume a summary of the entire Sumadhva Vijaya is already given. However, for the ready reference of the readers a brief summary of Canto 9th to 16th included in this volume will be given again. It is not verbatuim reproduction of the summary given in the first volume. However, the contents are the same. 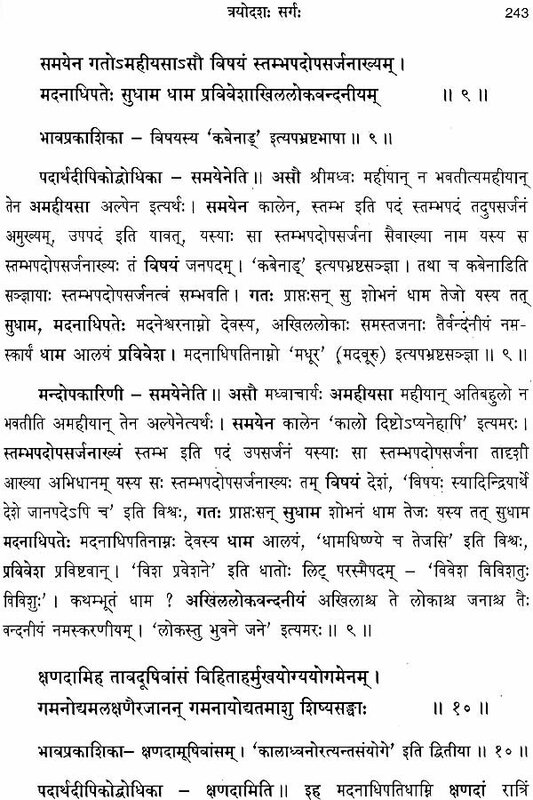 In the first eight cantoes (i) A description of the earlier two incarnations of Mukhyaprana, (ii) The need for the third incarnation, the birth and childhood of Sri Madhvacharya, (iii) Sri Madhva's upanayana and Gurukulavasa, (iv,v) Sri Madhva taking sannyasa, his coronation on Vedanta Samrajya peetha, his composing Gitabhasya and his south Indian tour, (vi to viii) Sri Madhva's visit to Badari, Sri Vedavyasasrarna and finally his visit to Sri Narayana with Sri Vedavyasa are described. i) It describes the Supreme God Visnu as full of auspicious attributes, free from drawbacks, bestower of jnana, bhakti and Vairagya and ultimately the liberation. ii) The supremacy of God is established by profusely quoting Sruti, Smrti and by reasoning. iii) Its style is simple, direct, flawless, and insightful. iv)This bhasya commands the respect of deities and sages. Sri Satyatirtha had the good luck of copying this bhasya. After composing Brahmasutrabhasya Sri Madhvacharya started his return journey from Badari and arrived at the bank of river Godavari. In an assembly of scholars who were well versed in Veda and Darsana, Sri Madhvacharya discoursed on Veda and criticised Nyaya, Vaisesika, Bauddha, etc., Darsanas. 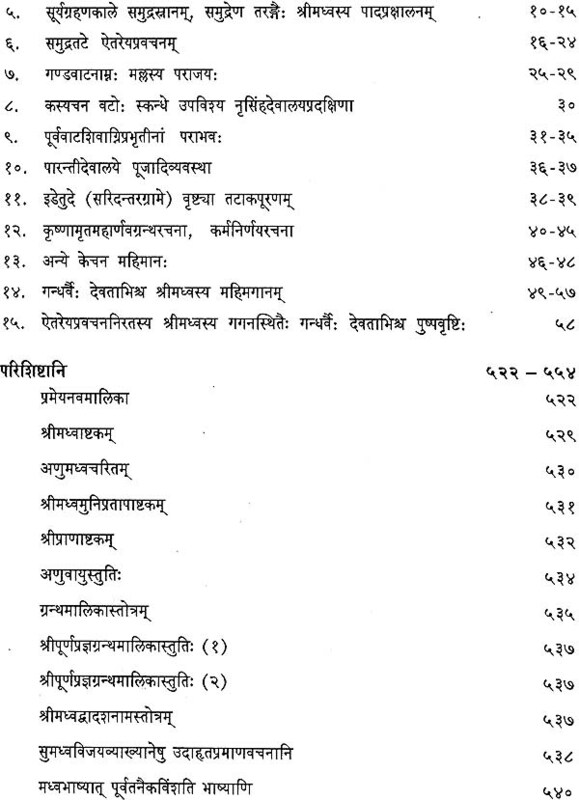 Sri Sobhanabhatta was the leading scholar among these scholars. He was impressed by Sri Madhva bhasya and started propagating it. 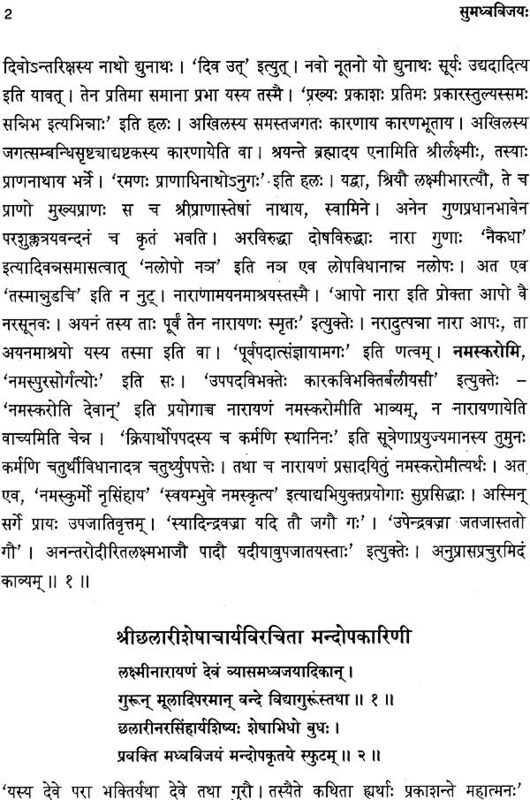 The poet compares the choice of Sri Madhvabhasya by Sobhanabhatta for study and propagation to the selection of daksinavarta conch i.e., the conch that has its face on the right side. A person who does not know the value of it throws it away. He who knows it to some extent sells it to get some money. But he who knows the highest value of it preserves it and worships it. Sobhanabhatta knew the highest value of Sri Madhva bhasya like that of a daksinavarta conch, admired it and worshipped it by propagating it among the jenuine devotees. Sri Madhvacharya returned to Udupi Achyutapreksa and another senior ascetic were happy to meet him. 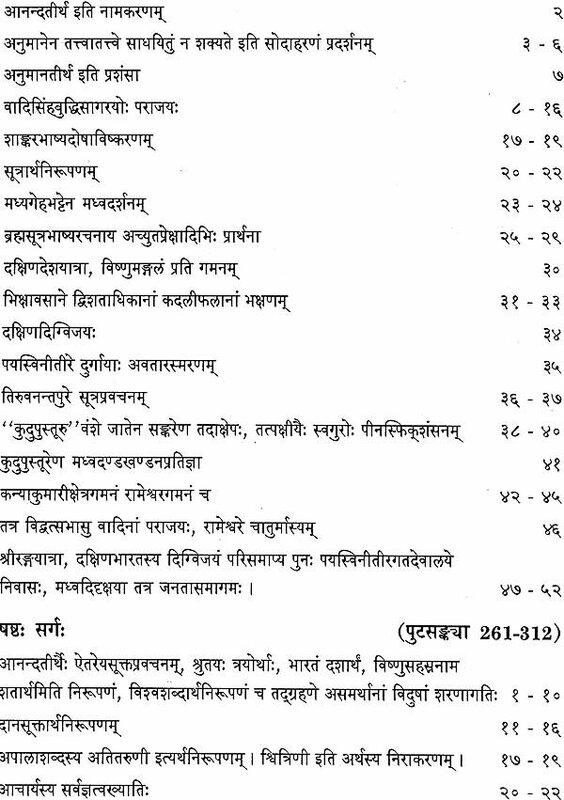 They had already received a copy of Sri Madhvacharya's Bhasya. Some doubts were still persisting in the mind of Achyutapreksa because of the earlier influence of advaita bhasya. Sri Madhva removed all his doubts like the swan pushing aside the crows from the lake. Sri Madhvacharya gave both the knowledge of Sastra and put Sudarsana mudra to his devotees. He installed the Idol of Srikrsna brought from Dwaraka at Udupi, This Idol was obtained from a navigator by saving his ship from a difficult situation. Sri Madhvacharya helped his teacher's son Vasudeva to perform a sacrifice. This indicates that the performance of sacrifices in dedication to the supreme God helps to aquire his knowledge and grace. 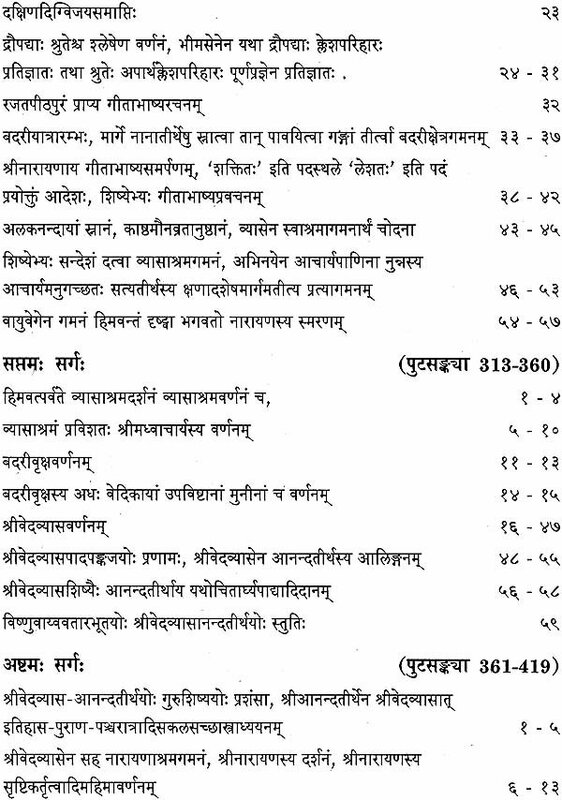 Sri Madhvacharya once again proceeded towards Badariksetra. 2) In the tenth canto certain events that revealed the extraordinary power of Sri Madhva are described. These are fully described in the introduction to the first volume. Therefore, these are briefly mentioned here by way of reminding the earlier description. 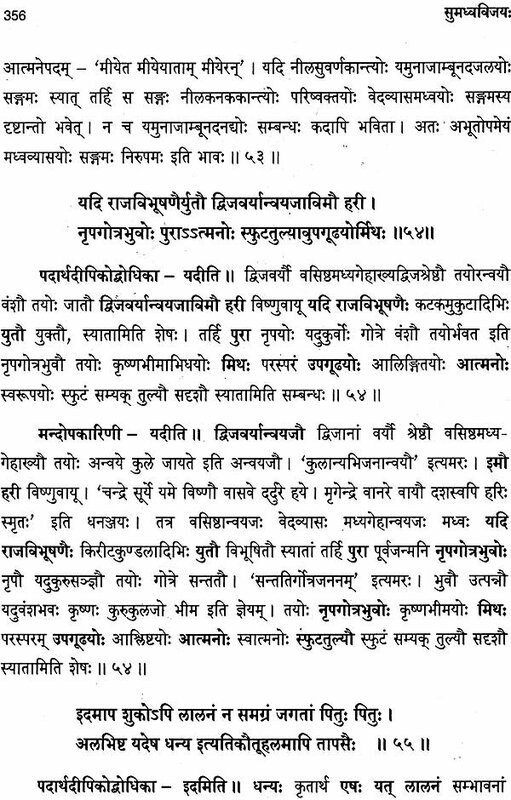 i) King Isvaradeva asked Sri Madhva to dig the ground. Sri Madhva asked him to demonstrate the digging. He started but was not able to stop it. He realised his mistake and begged pardon from Sri Madhva. ii) When Sri Madhva and his disciples arrived at the bank of river Ganga there were no boats to cross it. Sri Madhva crossed it walking on the river with his disciples. The Muslim ruler who watched it was wonderstruck and offered half of the Kingdom to him. iii) In the course of the journey the robbers encroached upon Sri Madhva's disciples thrice. They were repulsed. A tiger pounced on Sri Satyatirtha. It died by mere touch by Sri Madhva. Sri Madhva completed his journey and reached Narayanasrama. Sri Narayana gave him Vyasa rnusti and asked him to compose Mahabharata tatparyanirnaya. Sri Madhva started his return journey. He observed Chaturmasa at Hastinapura. Ganga river appeared before him through the branch of a tree and also personally in a beautiful form. Then Sri Madhva went to Varanasi. A sannyasi by name Indrapuri met him and discussed the point as to how jnana supported by karma is the means of liberation. Sri Madhva explained that jnana is the primary means of liberation and karma performed after jnana increases the bliss. During his journey Sri Madhva delivered discourses. In the course of his discourses he stressed three points. (i) God is supreme. There is none who is equal or superior to him. (ii) It is by the will of God that the creation, sustenance and destruction of the world take place. (iii) He has jnana, ananda etc., unlimited number of attributes. He is conveyed by all words. At Kuruksetra Sri Madhva saw the gad a held by him when he was Bhima. At Hrsikesa, Sri Madhva received bhiksa from Rudra. He visited Parasurarna ksetra. At Goa he made the trees and plants to yeild the flowers and fruits by his music. 3) In the elevanth canto there is beautiful description of Vaikuntha. Adisesa who came to listen to the discourses on Brahmasutra by Sri Madhvacharya describes the Vaikuntha. At the centre of Vaikuntha there is the city of the Supreme God. The houses built by padmaraga gems shine in the midst of white compounds built by Sphatika. The terraces are studded with sphatika with hanging blue gems. There are beautiful birds carved in the pegeons which look like real birds. All these decorative items are the forms of Mahalaksmi. In this city there are a large number of earlier liberated chaturmukha brahma, Rudra etc. There are four states of liberated viz., Sarupya, Samipya, Salokya and Sayujya, The poet impressively describes the women, seasons Vasanta, Grisma etc., and the flowers parijata etc.